The Action Ops Snow And Sable is the latest science fiction based online slot created by Triple Edge Studios. The slot has a RTP of 96.03% and a high to medium level variance. You can set the wager between 0.10 and 100. The maximum payout is 100,000 in a single round. The game provides the opportunity to explore the action world with Snow and Sable to reveal Wilds, Scatters and Free Spins. Why Action Ops: Snow & Sable? 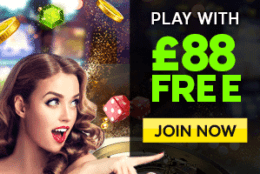 You can count on Microgaming to provide an interesting and enjoyable slot, and in addition to that, this game can reward you with significant profits. Where to play Action Ops: Snow & Sable? The storyline of the game is set in a not so distant future city of Aurora where cyborgs battle the robots for control of the city. The police officers Snow and Sable are the two main characters who battle the criminals in Aurora. Other than the two heroines, the game’s logo, bugs, cars, glasses, and watches are some of the more important symbols. Thanks to the developers, the game is very appealing, and the RTP is 96.03%. The slot’s two main characters are two powerful women, Snow, and Sable who are adorned in white and black costumes respectively. There is a beautiful landscape as the background, and Snow and Sable are the Wild symbols. The other game symbols are the game Logo Scatter, the Space Cars, Bug Robots, Hi-tech Glasses and Watches, and finally the A, K, Q, and J playing cards. The game is played on five reels, three rows, and 10 fixed pay lines. The Action Ops Snow And Sable has been mainly developed for tablet operators. You can change the settings through user-friendly touchscreen buttons, and you may also choose different situations for the spin option to get started. Another important feature is the Stats Option. With this function, the player can check the number of played rounds, game time, and his/her top three wins. The game rules are quite easy to understand and follow. The police officers Snow and Sable are equipped with all sorts of high-tech tools and devices. The duo act as Wilds that can replace all symbols except the Logo and themselves. You have to click the Wilds to get the top jackpots. 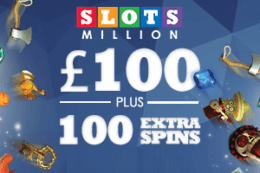 The slot’s logo is the Scatter symbol that triggers the Free Spins feature. The Wilds operate nearly all the action and supply both separate and varied pays. 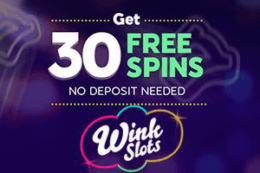 You can get access to a top-paying 10, 15 and 20 free spins by having three, four, and five logo symbols respectively. You can also win a reward up to 100x your stake. 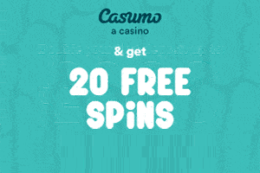 You can have one additional benefit with the Free Spins, which is the presence of two Wild symbols on the first and last reels. 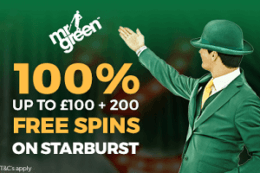 You also get the chance to win more free spins along the way. During the free spins, reels one and five can be filled with a symbol showing either Snow or Sable. 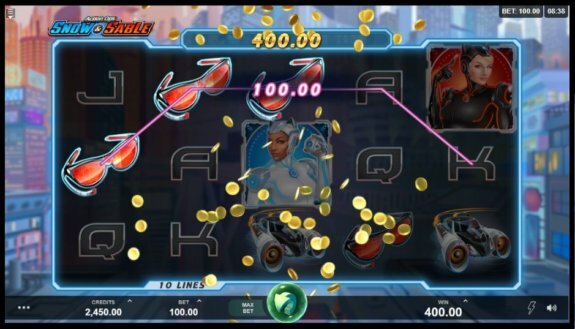 The slot features 10 pay lines, which pay left to right. You have to land a minimum of three matching symbols on a pay line to start winning payouts. Hit the spin button after setting the wager between £0.10 and £100. Enable fast play to speed up the reels or enjoy the game by activating Autoplay. Play Action Ops: Snow & Sable for free! The two main characters act as Wilds, replacing all the common symbols in the game. When five Snow and Sable Wilds individually appear on a line at the maximum bet, you will win 100x the stake. If five of them come together, you will gain 50x your stake. The game logo represents the Scatter symbol. With three, four and five Scatters, you can earn 10, 15 and 20 free game rounds respectively. You can also win cash rewards for your Scatter symbols. With three Scatters you can win 2x the stake, with four Scatter symbols 10x the stake, and with five Scatters you can win 100x stake. 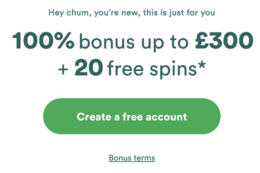 The added bonus of the slot’s Free Spin feature is extremely rewarding. Reels one and five will turn into Wilds to increase the possibility of any winning lines combination and the winning line payout. The maximum payout is set at 1,000x the bet. With the card symbols, A, K, J, and Q, a row of three of the same earns you 5x your stake, and a row of five earns up to 30x your original stake. The payouts for the Sunglasses and the Watch range from 10x to 80x for five of the same symbols. The Robot Ladybug pays 120x, and the Space Car pays between 20x and 250x for three to five symbols. To win you have to consider some tips and tricks before hitting the spin button. There are various tips and tricks out there which are crucial if you want the best chance of winning. Here are the three most important tips which will help you to earn the maximum payout. Try playing for free before wagering real cash. 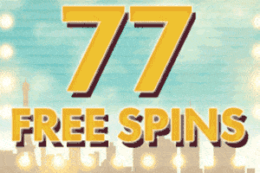 Free Spins offer a great way to learn the game and to find out how to win. A wagering paythrough defines the amount you have to bet before your bonus is released. Always start with a low wagering amount. Bet wisely to win. The game is a medium to high variance video slot and it would help to bet a little high. To sum up, the Action Ops Snow And Sable slot review is an honest look at the slot. 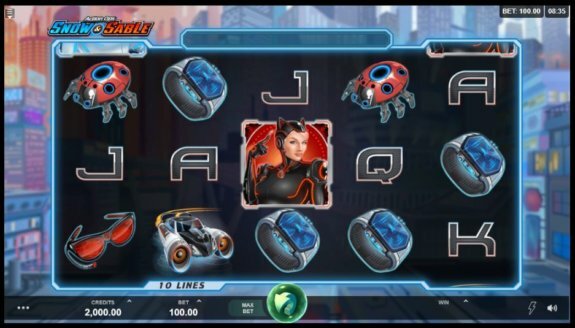 The game was developed by the Triple Edge Studios for the Microgaming operators. The crime-fighting-themed slot story is set in the near future where police battle criminals. 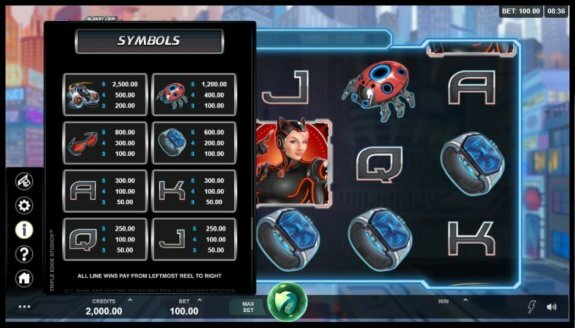 There are some symbols and free spin options for cash rewards. The features are great, and the maximum payout is set at 1,000 times the bet.